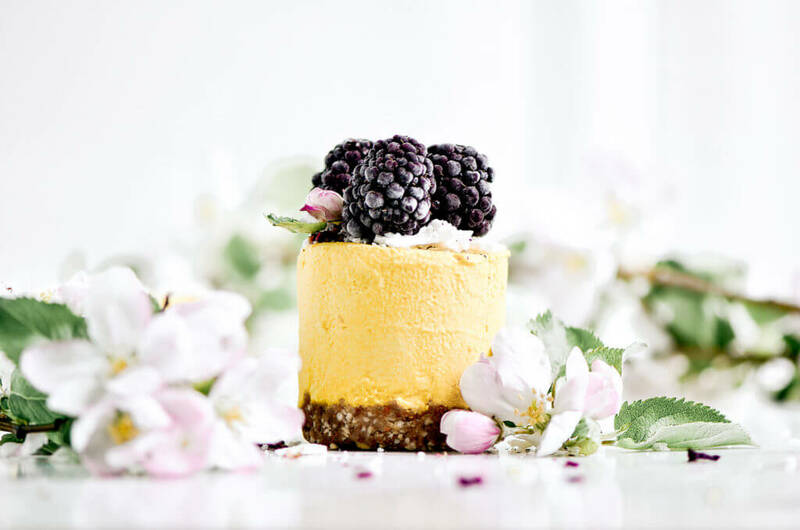 This no-bake Paleo and vegan cheesecake is topped with a thick creamy lemon layer with a simple nut and date crust. 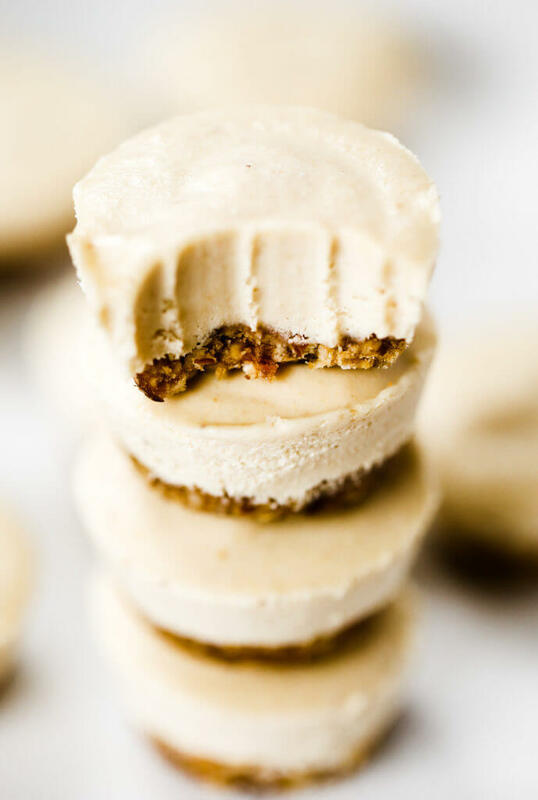 Bite-size cashew cheesecake is made quickly in a blender or food processor, then chilled before eating! Gluten free, dairy free, refined sugar free. Who here loves lemon?! Now, I LOVE lemon. And these babies are like a lemon lover’s dream. 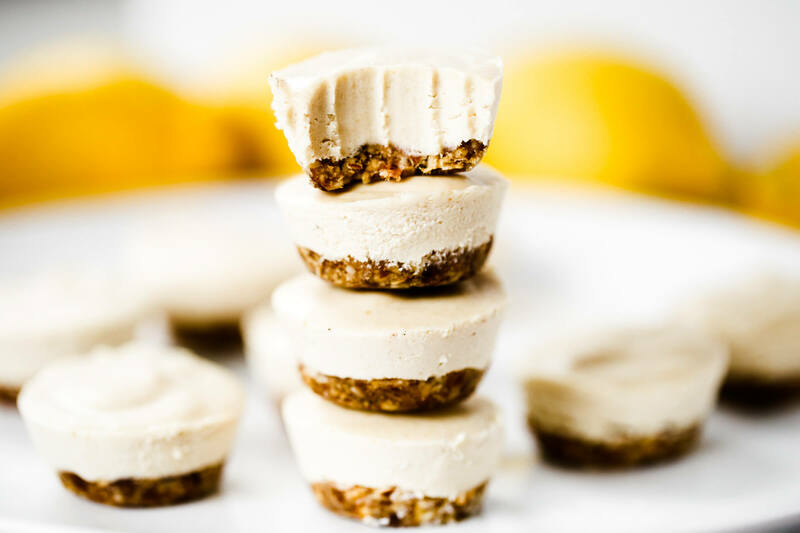 So much tang, so much sweet, and so much beautifully raw vegan bites of L E M O N.
Food processor raw desserts are pretty much at the top of my list for favorite treats to make. 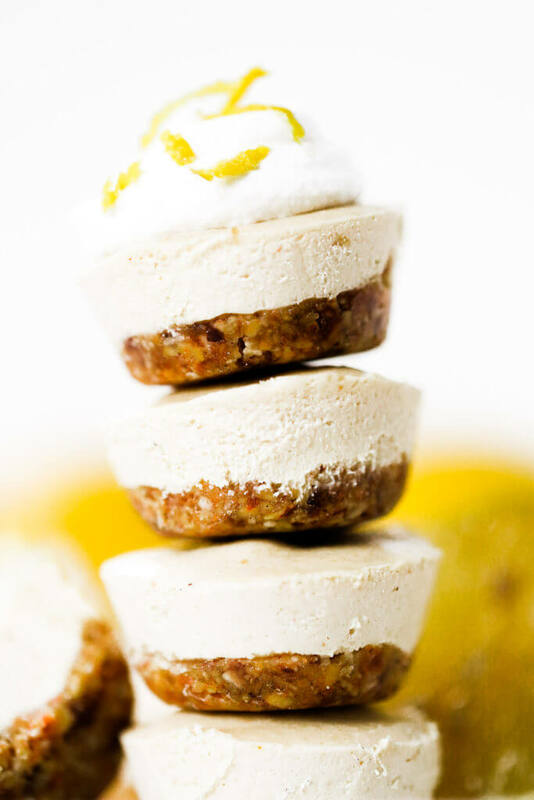 I think it’s mostly because I love creamy desserts and raw food (cashew cheesecake is my favoriiiite!). 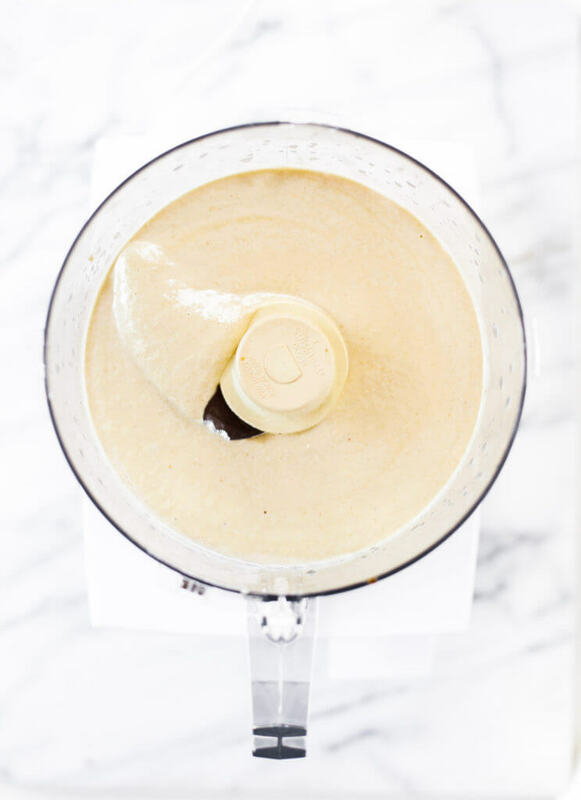 And I love using my food processor to make life easier! 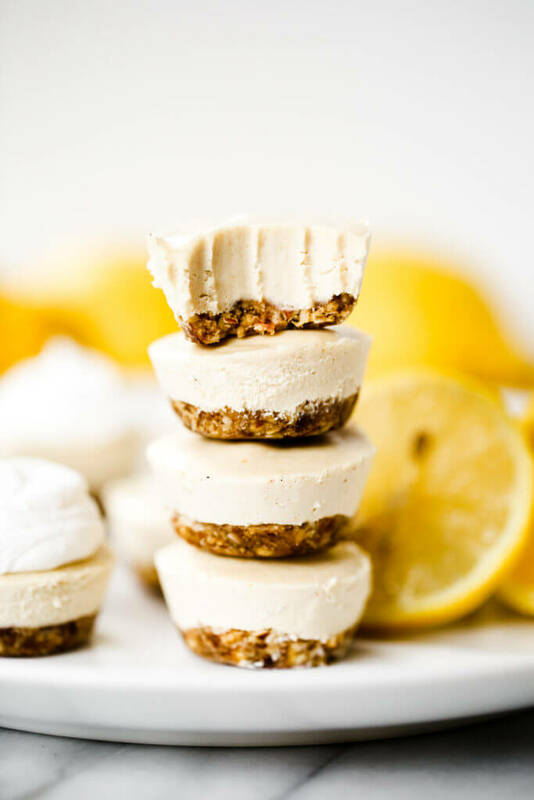 That paired with my impatience to wait to eat dessert + my love affair for raw dough pretty much makes me the perfect candidate for these raw lemon bars! And holy yum, these are gooood! I love everything about them. Maybe I am biased, but biting into the creamy center and the tang that bursts in your mouth… gimme seconds! 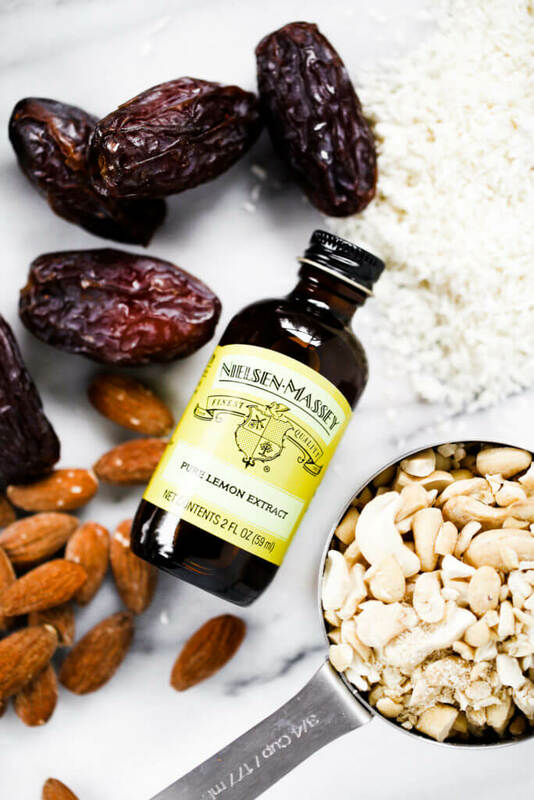 I used a handful of nourishing whole food pantry ingredients for this recipe along with Nielsen-Massey’s Pure Lemon Extract for the perfect combo of tangy and sweet. 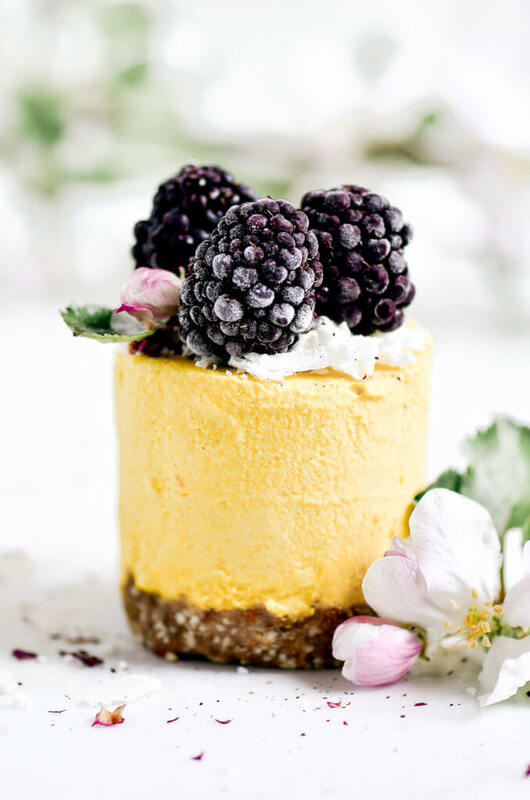 A healthy zesty dessert for parties, midnight snacking, or the perfect thing to add to your emergency dessert stash in the freezer… Don’t tell me you don’t have one. These cute little cups make a great kid friendly treat! 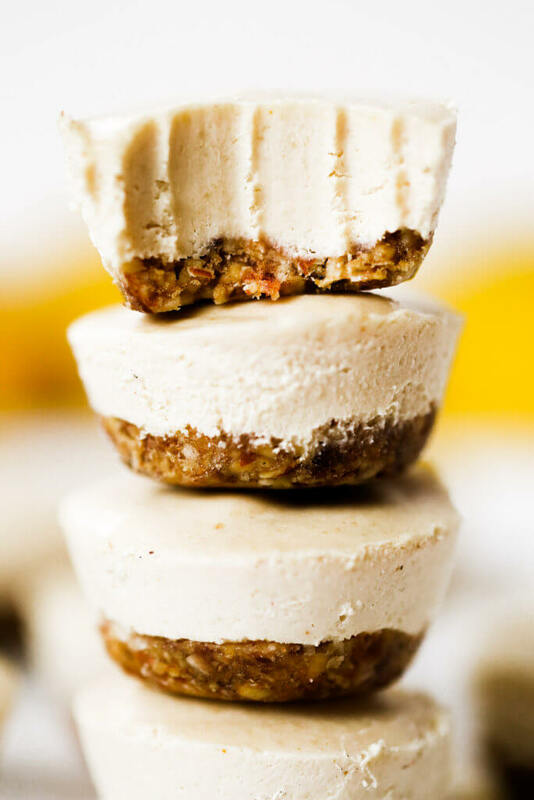 I even got my younger brother to eat cashew cheesecake and LOVE these!! … Not before eyeing me and inquiring if they had cauliflower or any other crazy healthy stuff in them. These were amazing! Loved the texture and flavor! 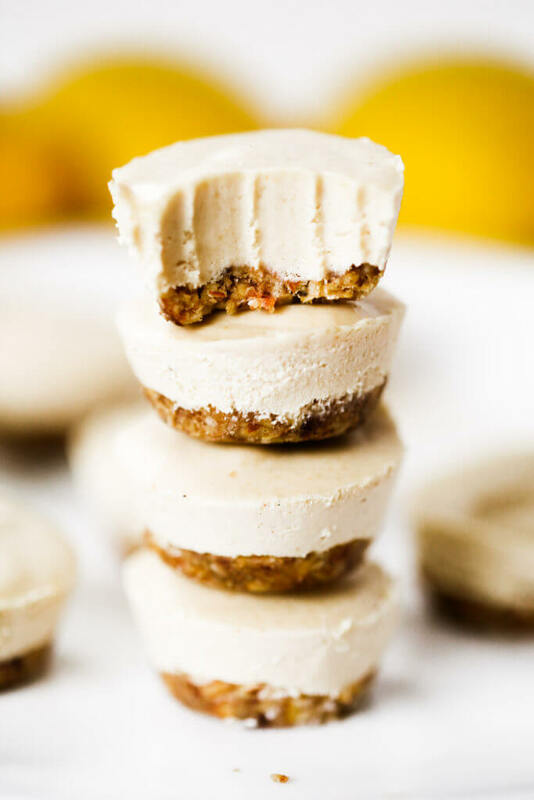 A perfect bite sized treat- love when I find vegan recipes that taste so good! These were great! Love how easy they are to make. So kid friendly too! All the kiddos in my house devoured them and loved the lemon touch. Thanks for such a great easy and healthy recipe! The recipe shows “of sea salt” and “of tumeric”—so I don’t know how much to use! Help! Hi Stephanie, it say just a dash of each- about a pinch. Would I be able to substitute Maple Syrup with Honey? I live in South Africa, and Maple Syrup is hard to come by, and ridiculously expensive. I can get maple flavoured syrup, but that seems like cheating. I always have raw honey on hand, though. 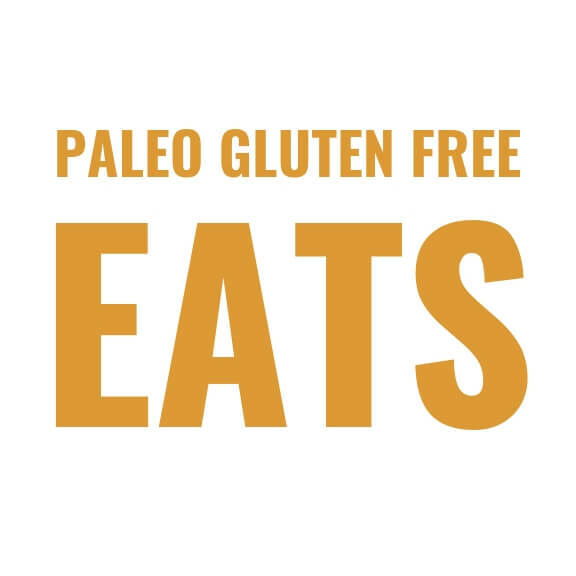 I can’t eat seeds or nuts due to diverticulosis and I’m concerned about the seeds in dates and figs, but know they are a good thing in paleo recipes. Bananas have tiny needs I about too. I Know you can use applesauce too, to reduce oil. Avacado is good too. But the texture of dates & figs are hard to duplicate. suggestions? Merci. Hi Gigi, I don’t know of a good sub, unfortunately. I tried your Twix bars and I reallly enjoyed them. So I decided to try this one out since I love lemon and cheesecake. 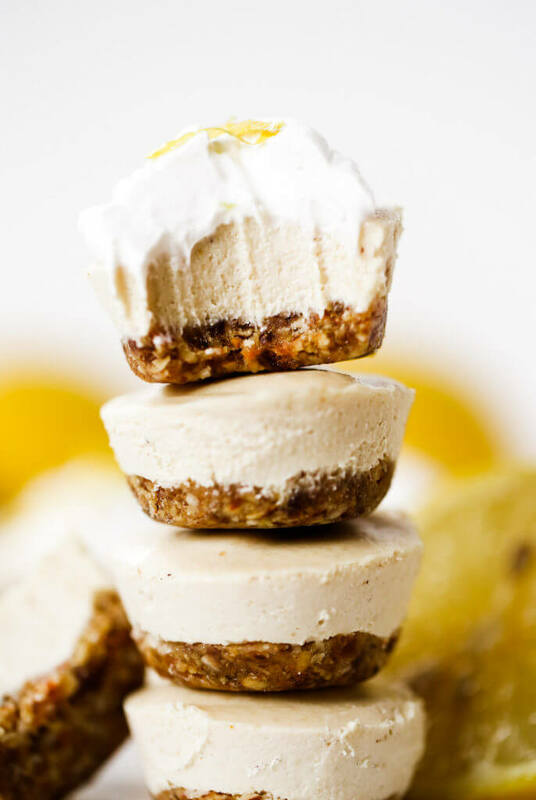 I have tried other raw cheesecake recipes but haven’t enjoyed them all that much, but this tastes great! Thanks for sharing. The recipe says 17 servings, but how much is considered a serving? I’m trying to figure out how many of the finished bites one recipe makes. I want to make it not A lemon cheesecake but an original cheesecake. Any suggestions for how to alter the recipe to make it original? Hi there, These look great! I want to make them for a potluck. Would they withstand sitting at room temperature for several hours, or would they get messy? Thanks! Hi Valerie, they are best chilled, I don’t know that they would last that many hours in the warmth. Sorry! How do I remove them from the mini cupcakes tins? Hi Shamira, I use a knife to swirl around the edges of each cheesecake, then pop it out. 🙂 You can also prepare them in mini paper muffin liners and this will be REALLY easy to get out! 🙂 Hope that helps. Here is is Janice 🙂 https://paleoglutenfree.com/recipes/raw-vanilla-bean-cherry-cheesecake/ Enjoy! Can I substitute coconut fat for coconut oil? Hi Jeanie, I’m not sure what coconut fat is…? Hi Kaylie, Can I use your strawberry cheesecake crust (with cashews) instead of this one with almonds? Thanks! Totally Rebecca! That sounds great!